11. the first row was inspired by wheat ear stitch, the securing stitch was taken at an angle, and another stitch was worked on to the chain stitch. The second row is a combination of knotted cretan and basque stitch. 12. the first row- after working basque stitch with chevron stitch, herringbone stitch is worked over it. 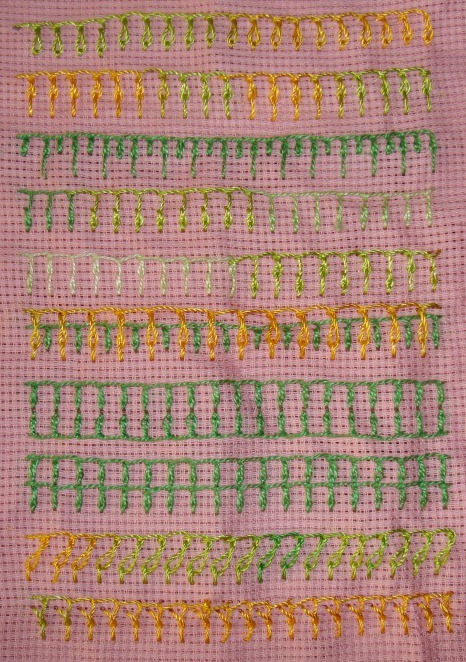 in the second row ,bugle beads are added in between basque stitches. 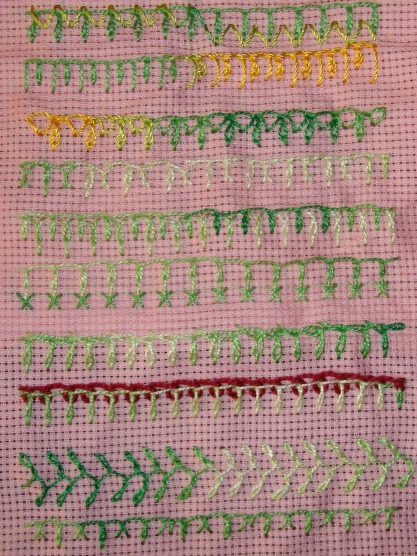 This week’s challenge stitch also lends itself to many variations. Some variations were surprising, and some were disappointing, but still interesting. I thank everyone , for their encouraging and inspiring comments. 6.in the first row, zigzag back stitch is worked in two ways on basque stitch. Basque stitch is combined with buttonhole stitch in the second row. 7. closed buttonhole stitch and bonnet stitch[not so good] are combined with basque stitch in these two rows. 8. twisted chain stitches are worked in between basque stitch in the first row, cross stitches are added in the second row. 10. the first row is influenced by chained feather stitch, this is basque feather stitch. This seems okay! The second row, is a combination of up and down buttonhole stitch and basque stitch. This week’s stitch of the TAST 2012 stitch challenge by SharonB is Basque stitch. I had done a sampler of this stitch on a plain cloth during the previous TAST challenge. So this time I thought I ‘ll try this stitch on even weave fabric. the stitches are worked with perle cotton, and cone thread. 1.the first row, is the basic basque stitch, in the second row, the stitch securing the chain stitch is elongated. 2.the basic stitch and it’s elongated variation is the first row, in the second row, the chain stitches are worked a little away from the main line. 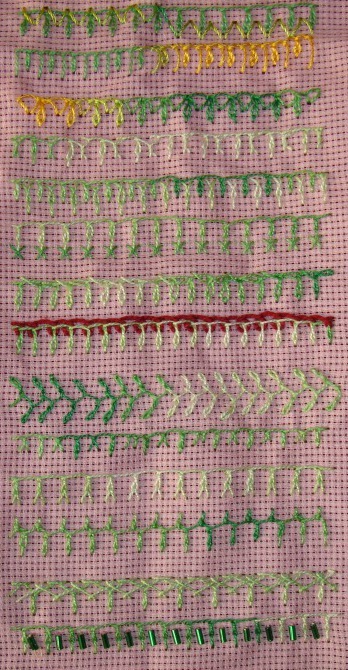 3. two variations of this stitch are combined in the first row, the short[green] and long[ yellow] versions of this stitch are worked one over the other in the second row. 5. the stitches are worked at an angle in the first row, the starting point of the stitch is one point below the main line in the second row.